What an interesting summer for insects it has been for us! 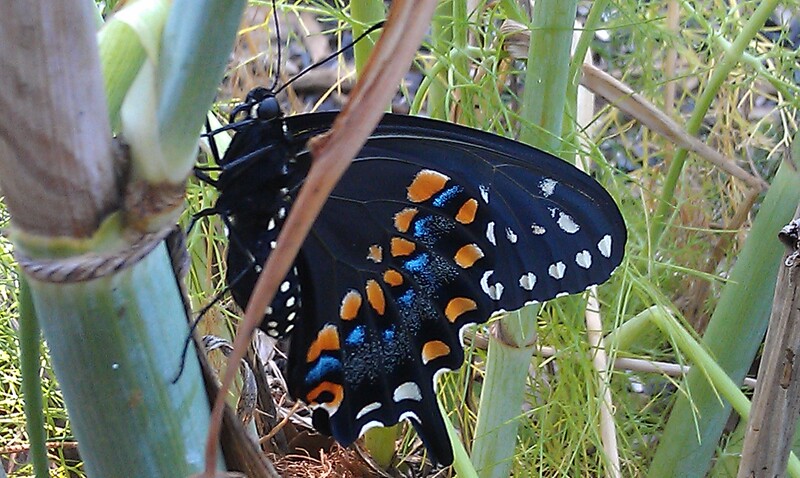 It started with our discovery of Black Swallowtail butterflies on our fennel plant (one of the dill family host plants for Black Swallowtails). The fennel plant which we did not plant! It was a dill plant two years ago. Last year we planted fennel in another place in the yard, however it got flooded by Hurricane Irene, and did not come back. However this spring we had fennel where two years ago we had dill. The ways of nature are wondrously mysterious! Anyway, The Daughter found caterpillars on the fennel, so we brought them in, made a habitat and enjoyed watching the entire process. Over the summer we had more generations of eggs, caterpillars and chrysalides and we began to see the differences between the instars and finally actually witnessed a Black Swallowtail emerge! It has been very, very rewarding! See video at bottom of post. Then the Cicadas started singing! Each summer starting in late July through August we see the castings of the cicadas on the bark of our American Holly tree, and on the garage walls and door. Our daughter’s swing is in the holly tree, so her practice is to come in the door and say “Can someone please come out here and get the creepy cicada shell?” The castings are a little bit creepy, but the emerged adult insect has lovely wings – we just so rarely see them! Of course we hear them singing from the trees on summer nights! 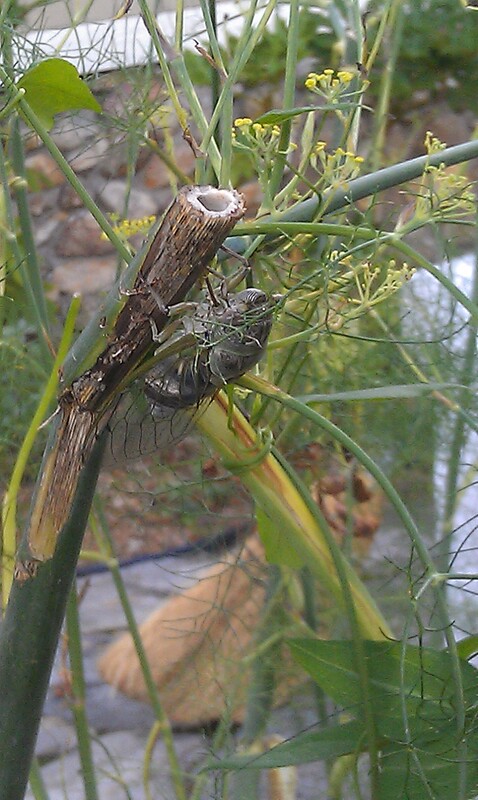 Fortunately, at the end of July, I was surprised by a rather large adult cicada on my fennel plant, I was able to grab a picture before it flew off. In mid-September on a morning walk, we happened upon an adult cicada that had died. We brought it home in order to examine it more closely. We looked at it through our lens, and took a few pictures. We looked up Cicada in the Index of our Apologia Young Explorers book “Flying Insects of the Fifth Day,” and reread the sections that describe how and why insects molt, and remembered that cicadas are in the class with only three stages: Egg, nymph and adult, termed the “incomplete metamorphosis” life cycle. We see our cicadas every year, and the bodies are dark silvery green with lovely green tinted wings, and golden eyes, making our cicadas the annual variety. These cicadas still spend a great deal of time under ground in the nymph stage, from 1 to 4 years, but they do not have a coordinated emergence like the periodical cicadas do. We went on You Tube and watched a few videos of cicadas from the 13 and 17 year variety – they have red eyes! The Cicadas have stopped singing, so we know we will have to wait until the Dog Days of next summer to study them some more. We still occasionally have a Black Swallowtail flutter by and it makes me a little worried since the fennel is eaten down to the nubs! We are planning to plant a few more fennel plants next year, as well as more marjoram and a few other butterfly nectar plants, still to be decided. Finally, we’ve been particularly delighted to keep an eye on a lovely bright yellow spider in the lantana. We check on her every day. 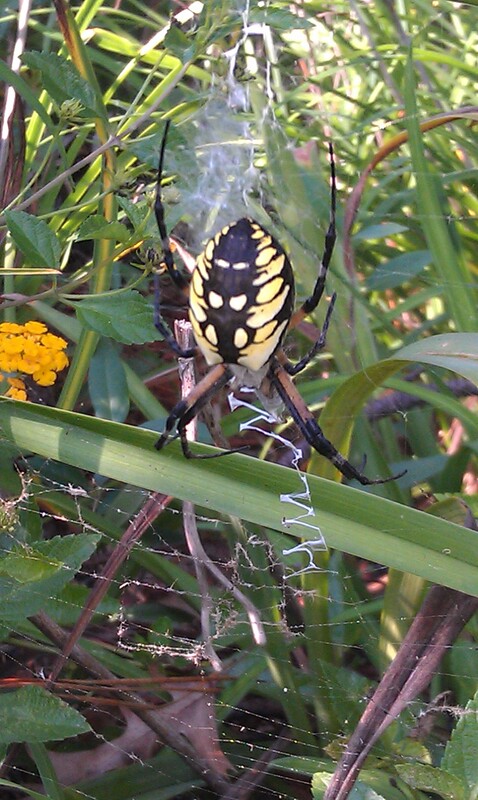 She is an immense Argiope aurantia (Ar-GUY-oh-pee our-RAN-chee-uh). Argiope is Latin for “with bright face”; aurantia, in Latin, basically means “overlaid with gold.” I think they’ve named her appropriately! She is quite beautiful! Did you notice I don’t have any pictures of my adorable daughter neatly completing a notebooking page, or doing a watercolor or anatomically correct sketch? Did you wonder why? Frankly, The Daughter informed me she “certainly hoped we would NOT be sketching the creepy cicadas.” Sigh. I was recently encouraged by a post from Barb at Handbook of Nature Study who encourages the use of photography for Nature Study. This was a bit of a relief to me. Because our nature study is in the afternoon after a day of school work, pulling out a notebook page or requiring a sketch causes barely suppressed groans. I don’t want nature study to be drudgery. So, I may schedule the paperwork for the morning next time and see if that goes better. This post is written to participate in the The Outdoor Hour blog carnival sponsored by Handbook of Nature Study blog. The topic for September was insects! Please click over and see how various families enjoy and explore God’s world by spending an hour or so outside! Here is a video of one of our Black Swallowtails emerging from the Chrysalis! You are so kind! I’ll do better next time!